WOWIO seems like a concept that's dead on arrival. The site offers free books in PDF format (no DRM) in exchange for minor, one might say trivial details like your credit card number, a non-anonymous email address (no Gmail, Yahoo, or Hotmail here), or a scan of a photo ID like a driver's license. In exchange for establishing your true identity, you can download public domain books like The Art of War, Brave New World, and Thus Spake Zarathustra along with a smattering of copyrighted works like Starship Troopers comics and Stephen Hawking's The Theory of Everything. So not only is WOWIO offering you freely available books behind a registration wall, but they don't exactly have the highest-quality copyrighted content either. If we were talking about a free, legal copy of Harry Potter and the Deathly Hallows, then maybe I'd understand. 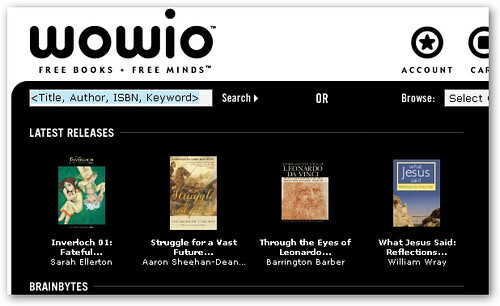 It looks like the idea behind WOWIO is to make money from selling advertising in eBooks and sharing your personal information with "other clients and partners". For a saner implementation of this idea, check out Freeload Press, which asks you to complete short surveys before letting you download free textbooks. The only "WOW" in this story is how they think the model can possibly work.